A passenger plane from Berlin lands at JFK airport in the middle of the night and suddenly goes dark on the runway. No contact can be established by the airport authorities, the plane is cold, silent, nothing moves and all window blinds are shut… except one. In the cargohold… a huge, centuries old wooden box (coffin?) with strange engravings of death and despair lies open. This is how the apocalypse starts. At least in Guillermo del Toro‘s “The Strain“. The legendary filmmaker of such modern classics as Hellboy, Pacific Rim, Devil’s Backbone, Pan’s Labyrinth and Cronos had an idea in 2006. An idea to give Vampires their bite back, or in this case their disgusting stinger/tongue thingy and to reimagine them as a viral sickness instead of a purely fantastical creature. Bored by the romanticised versions of vampires he wanted to reintroduce them as the terrifying monsters they should be and pitched “The Strain” as a TV show to several US cable networks. After that didn’t work out as he had hoped (one network even wanted him to turn his story into a comedy) he decided to turn his idea into a trilogy of novels. Together with Chuck Hogan (who wrote the book “Prince of Thieves” on which Ben Affleck’s “The Town” is based on), Guillermo del Toro started writing the story of the vampire apocalypse as he imagined it, with everything that makes a del Toro story a del Toro story: Vampire physiology right out of his Blade 2 script, creeping terror, dread, monster autopsies, nazi imagery and reluctant heroes. To complete his story he wrote three novels in total; “The Strain“, “The Fall” and “The Night Eternal“. In 2011 Dark Horse Comics and David Lapham began working on a comicbook adaptation of the trilogy, which is currently just three issues away from the ending. A must read for fans of del Toro’s special brand of horror and horror fans in general, the Dark Horse comic has been a huge success. 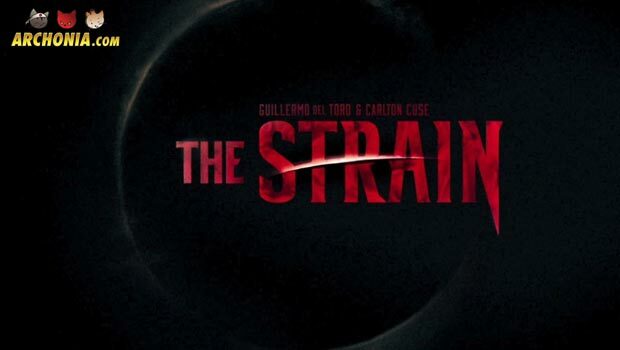 And because of that success the FX network picked up the rights to “The Strain” and brought it finally to television! The series premiered last July in the USA and has been an instant success. And thus as fate is known to be a somewhat weird mistress, the story of del Toro’s vision to make Vampires scary again on TV is now really happening as he originally intended. Del Toro himself is heavily involved, as he directed the pilot episode and will be back in the directors chair for as many episodes as his busy timetable lets him (as you know he is currently working on a Pacific Rim sequel, Justice League Dark for DC Comics and Warner and a whole army of other horror inspired movies). The first season is currently still running and is a great horror show with slow pace, a lot of science and steady rising levels of dread. Are you ready to be scared of Vampires again?